With Major League Baseball’s winter meetings wrapping up and teams around baseball continue to make moves in an attempt to improve rosters heading into the 2016 season, the Kansas City Royals are staying relatively tight-lipped about what they plan to do regarding players such as Alex Gordon, and what other players they may look to bring in. Word around the league has mentioned several potential candidates the organization may be interested in, including Jason Frazier from the Cincinnati Reds for prospect and potential future star Raul Mondesi, Jr. Such a move seems to be somewhat risky, considering Mondesi’s potential, and likelihood of taking over second base possibly by the all-star break next season, as well as giving the Royals a talented player to eventually replace Alcides Escobar at shortstop down the road. With Frazier, the Royals would get a home run hitting left fielder, but one which hits homers in a batter friendly park. Kauffman Stadium is a pitching friendly park, which means his 35 home runs don’t exactly translate 1-for-1 in a trade. Regardless of what Dayton Moore and the Royals workout with the roster moving forward, 2016 spring training in Surprise, Arizona, is just around the corner thanks to a deep playoff run resulting in a World Series Championship. The first spring training game for Kansas City is scheduled for Wednesday, March 2, 2016 at Surprise Stadium against the Texas Rangers. As a whole, the team will look nearly the same. The only players which have been lost thus far are Ben Zobrist–a big loss for Kansas City fans–and Alex Rios, who was a integral part of KC’s postseason run. Although he has yet to sigh elsewhere, starting pitcher Johnny Cueto will find himself on a different roster, and there is a good chance the face of the franchise and local favorite Alex Gordon will no longer be with the organization. The have added former Royals star closer Joakim Soria and also resigned starting pitcher Chris Young. The $39 million spent on those two players shouldn’t get in the way of resigning Gordon, or bringing in another quality player, it’s just a matter of what they will have to give up in order to do it. There have been rumors of Yordano Ventura being used in a trade, as well as the idea of bringing back aging pitching James Shields, who spent last season with the San Diego Padres. With Lorenzo Cain, Mike Moustakas, Eric Hosmer, Escobar, and Salvador Perez still in the fold, the core of the back-to-back World Series appearance Royals remains and like they have the last several years, will likely dominate spring training. 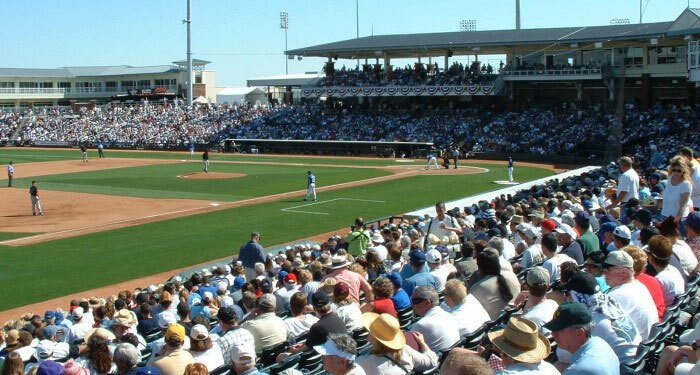 As the pandemonium for the Royals continues and fans become even more engaged in the organization, Surprise Stadium will continue to fill seats for each and every spring training game. With tremendous weather and a serene surrounding in Arizona, spring training has become a vacation destination for many. Tickets For Less has each and every game at Surprise Stadium on sale now. March is just around the corner so don’t delay and visit Tickets For Less to purchase your seats and watch your Kansas City Royals prepare for the opening of the 2016 season. With zero hidden service fees, what you see is what you get on all purchases. Get out and enjoy the beautiful sun and some spring baseball and cheer on your defending World Series Champs!